I really do not understand why a serial killer must leave behind a signature, a hint, or a proof of his presence besides a dead body (supposed to be one of his victims). Perhaps, it is because just to show his identity and that all should be terrified of him. Why must anyone kill any innocent people just to solve his purpose? All such questions have made me think about a recent crime thriller book that I read some days ago. 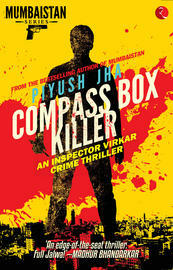 I find the book titled 'Compass Box Killer - An Inspector Virkar Crime Thriller' written by Piyush Jha very thrilling and intriguing as well. I was amused when I came to know about the serial killer's compass box been found besides his first victim with a note written in blood, which says in the quoted lines [‘Akurle is just the first to die. To find out who is next, find me first.’]. I liked the main protagonist's tactics and wits to handle situations well. 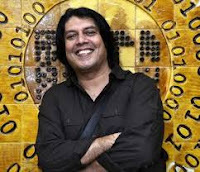 He was Inspector Virkar, the chief investigator of the Crime Branch of Mumbai Police. His intelligence and sincerity reminds me of an honest senior officer in the real life scenario. Inspector Virkar's alertness, diligence, and the ability to chase the next victims are indeed praiseworthy. Above all, I must thank the author, Piyush Jha who has been successful in entertaining us all. In his book, Jha has very beautifully described the scenes taken from the real Mumbai city scenario. I liked his plot, and how the situation that created when a dead body with a written note inside a compass box is revealed. It seemed like a child's play that the killer has to tell about his next victim's name and the solver must save that person before being killed. However, I was quite humored by the way Inspector Virkar's talking to himself, and a branded beer in his hand and his favorite 'vada paos'. It all seemed as if he was some real person in action. The end part of the story is even more mysterious. Virkar's endless efforts to catch the compass box killer were admirable. The last chapter has indeed revealed the grave motive of the killer's act. It was sad and pathetic at the same time. I must say that the book is worth reading. Piyush Jha is an acclaimed film director, ad filmmaker, and the author of the bestselling novel, Mumbaistan. A student political leader at the university, he pursued a career in advertising management after acquiring an MBA degree. Later, he switched tracks, first to make commercials for some of the country’s largest brands, and then to write and direct feature films. His films include Chalo America, King of Bollywood, and Sikandar. He lives in his beloved Mumbai, where he can often be found walking the streets that inspire his stories.